A safe harbour beach, a netted pool with fantastic places to climb and leap joyfully into the water. A kiosk and cafe with fantastic views. You’d seriously have to be bonkers not to get straight down there with the kids. 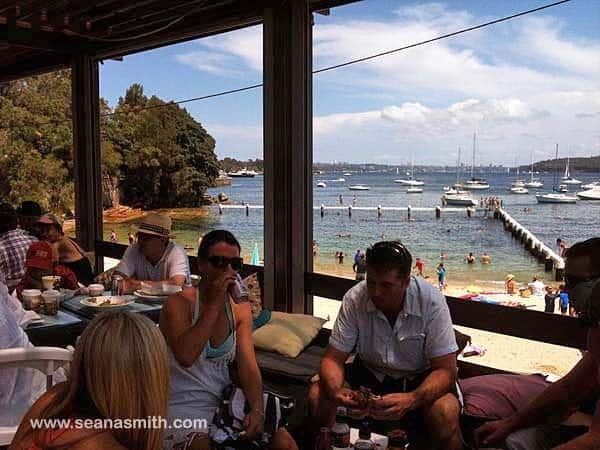 Little Manly Beach is a beaut spot in itself, but having the cafe there too really makes it a family mecca, and it’s as good on sunny winter days as it is in the ice block melting scorching days of summer. There’s something there for all ages of kids. My daughter loves the rock pools with their crabs and anemones. Rusty Rocket loves leaping off the shark net walkway. Dexbox wore goggles and chased fish for ages. Giant Teen loves jumping too, showing off for the pretty girls I suspect. And I love sitting in the cafe there, reading the papers and drinking coffees. 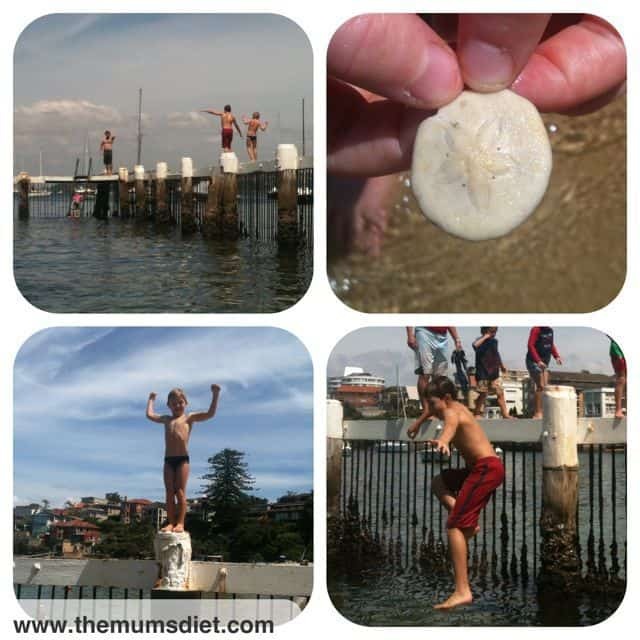 I go jumping and rock pooling with the kids, my highlight is watching a stingray sitting on the seabed some days. And a coffee at Little Manly Beach Kiosk. It’s so cute, has stupendous views and is very child-friendly. 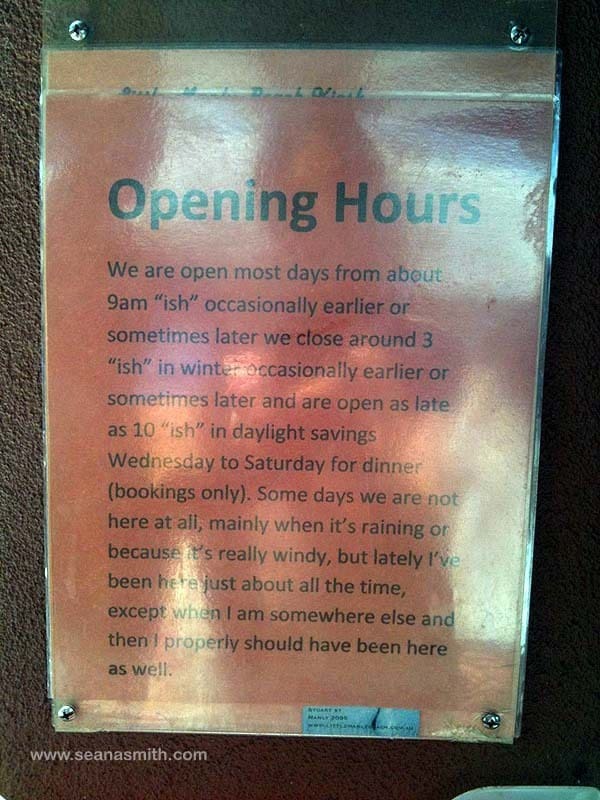 Plus it wins the prize for the coollest opening hours sign – see photo below! This is a kiosk and cafe, serving full meals and also selling drinks and ice blocks to the beachgoers. Breakfasts are substantial, lunches too. To see the menus, click on the website above. There are several tables and chairs under cover as well as some outside shaded by umbrellas. There are some very comfy seats, plus many cushions scattered around.Not much room for strollers, but it’s a marvellous spot if you have older children as they can play on the beach, or swim in the sea whilst you sit in the cafe. Well, that’s the theory anyway. Can’t say it often works for me! I wonder if I could sneak down there with a book when the kids are at school!??! 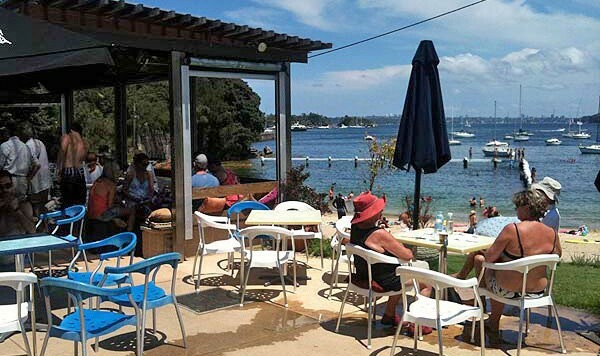 Do you love a beach side cafe summer and winter too? Where’s your favourite spot for a swim and a snack, a coffee and cake or a full meal? 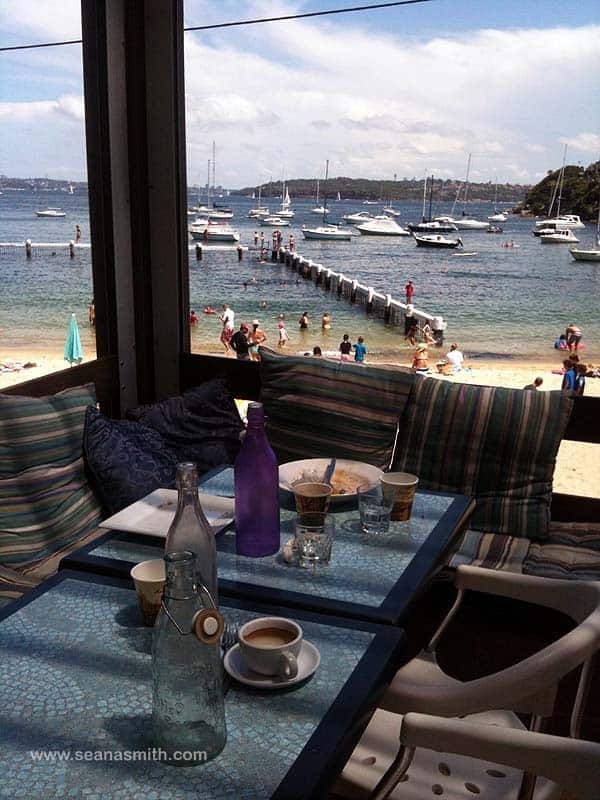 One day I shall get a grip and list the loveliest of the Sydney beachside cafes. I know the Northern Beaches and Harbour ones well and could ask for advice for the Eastern Suburbs. A bit of extra research would be most enjoyable too. I’ve been there – well not to the cafe but the beach. It’s gorgeous. I love those sand dollars – we don’t find them here in Noosa. I strongly suspect Kate didn’t get there. I bet she’d love to sneak down there for a cuppa in just a sarong, a cossie and a pair of thongs, with baby George in a sling. Didn’t those Royals work like demons when they were here? We’re lucky to live here all the time and get a chance to cillax on our fab beaches. I was wondering what that picture was. A sand dollar? I grew up near Terrigal and I don’t think I’ve ever seen one! Bookmarked the cafe for a next trip to Sydney. Thanks Seana. 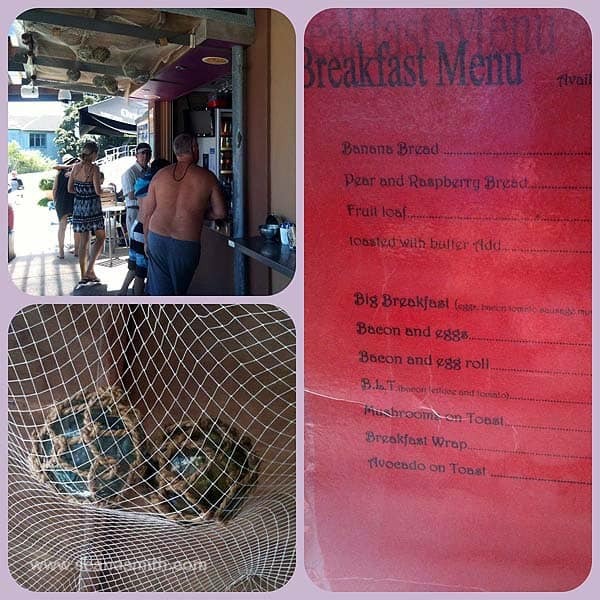 My pleasure… we see sand dollars a fair bit here, they’re actually a type of sea urchin. Don’t think I have ever seen them properly alive though.